Pinpoint Labs, an industry leader in providing defensible e-Discovery software to law firms, service bureaus, and corporate companies, announces the release of the latest update to its’ Harvester Product Family. Using Harvester 5.0, Search and Collect Discoverable Web-Based Email, User Files, and More. 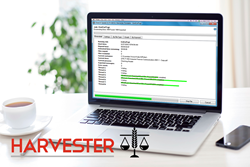 The release of Harvester 5.0 Portable and Harvester 5.0 Server represents significant expansion to address what is, for many, the most common source of e-Discovery information- email and attachments. By integrating IMAP sources into Harvester, the user can process OST’s and PST’s without installing Outlook. As a result, the average processing speed of Harvester 5.0 has increased 200-300%. Keeping with best practices for preserving and collecting e-Discovery data, Pinpoint Labs designed Harvester 5.0 to easily and defensibly gather multiple files and folders, with minimal impact on client systems. Clients appreciate the robust all-in-one tool for its’ affordable licensing fees and portability. Pinpoint Labs develops e-Discovery collection software- providing defensibility to legal and information technology professionals seeking to collect discoverable information from laptops, desktops, file servers, web-based email platforms, Office 365, and SharePoint sites. For additional information regarding Pinpoint Labs or Pinpoint Labs’ products, visit http://www.pinpointlabs.com. To follow industry news, visit https://www.linkedin.com/company/pinpoint-labs?trk=top_nav_home.